Researchers have used a series of MRI scans and graphics software to generate three-dimensional models of the equine brain in remarkable detail. Their extensive scanning of an eight-year-old Warmblood’s brain has been described in the open-access peer-reviewed journal, PLOS ONE. The horse had been euthanized shortly before the scanning as a result of a complicated lower-leg fracture. Martin Schmidt and his colleagues noted that high magnetic field strengths for MRIs are now available in veterinary medicine, providing big strides in image clarity and detail. However, despite considerable progress in adapting scanners for use in equine medicine, the description of the form and structure of the brain of the horse has been somewhat neglected. “Currently, studies describing equine brain anatomy are only available at reduced resolution and from the brain of foals,” they noted. In their study, MRI scans of the brain were performed on a 3-Tesla Magnetom Verio scanner using an eight-channel phased array human knee coil. Anatomical images of the entire brain were acquired from multiple angles, with a total scan time of 4 hours and 55 minutes. The images were reviewed using graphical software which allowed interactive assessment of the form and structure in all image planes. A three-dimensional model of the outer brain surface was successfully generated. 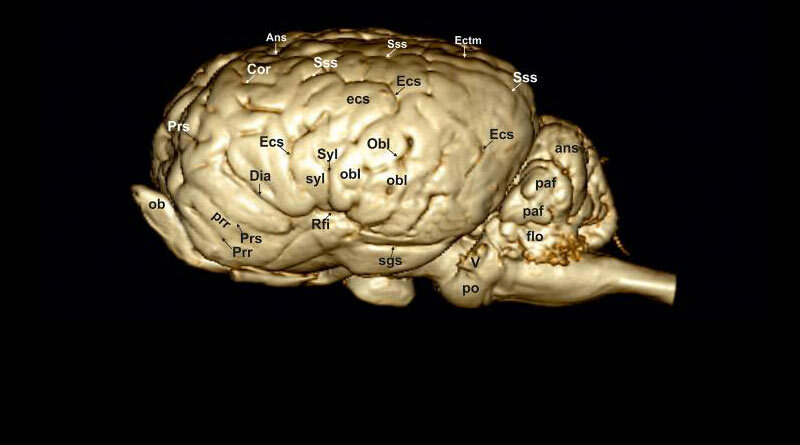 Mid-sagittal magnetic resonance image of the equine brain. They say the detailed imaging they produced should prove useful for MRI interpretation in horses, given that brain scans are becoming increasingly important in veterinary large-animal neurology. They say their work may serve as a starting point for further research aimed at analysis in living horses. Following the scanning, the study team removed the horse’s brain for the preparation of stained slides suitable for viewing under a microscope, with the slicing done to match the same orientation as the MRI transverse slices. Discussing their findings, the researchers said that, to their knowledge, there was no comparable study in the horse. “The present paper is intended to serve as a broad introduction to equine brain morphology [form and structure]” they said. In general, they said, the equine brain reflected the “mammalian blueprint”. The pattern of the equine gyri and sulci (the sulci are the grooves and the gyri are the “bumps” that can be seen on the surface of the brain) is far more complex than in carnivores and in other ungulates. It has been shown that the level of gyrification in mammals is associated with increasing body mass. However, when species of similar brain weights were compared, ungulate brains show this feature significantly more. The shape of the equine cerebellum is very characteristic among ungulates, showing a vertical orientation rather than lateral expansion. The study team comprised Schmidt and Carola Knemeyer, from Germany’s Justus Liebig-University, and Helmut Heinsen, with the University Hospital in Wuerzburg, Germany.